School is officially in session for the Fall! Some, went back in the middle of August, others started yesterday. The first week of school is more important than people think. During the first week, you meet your new professors, new classmates, and get an overall view of the class. The first week can be stressful, but it doesn’t have to be that way. 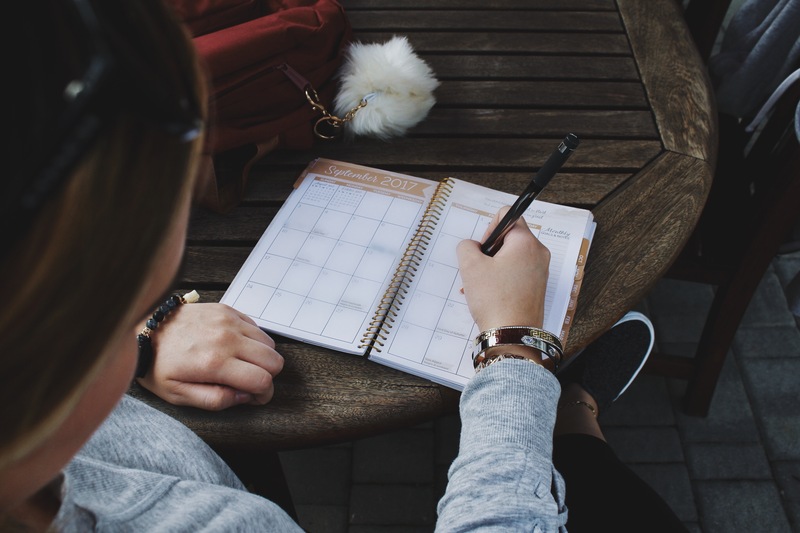 In this post, I’m going to be sharing my tips on What To Do During The First Week of School (from a college student perspective). If your teacher only puts your syllabus online, print it out. I’m someone that likes physical copies of things. I can’t take notes or look at school work online. Some professors don’t print out the syllabus for you, so you should do it yourself. Printing it will help you stay more organized. You’ll be able to highlight, cross things out and make notes all over it which will help track the work you’ve done and haven’t done. Going off of #1, write the important dates in your planner from your syllabus. This is always a great tip. Having the important dates of tests, days off, homework due, projects, etc in multiple places will help you remember them better. After I get a syllabus from a teacher, I always take a pencil and write the important dates in my planner. You want to use a pencil because a syllabus can always change and it’ll be annoying to use white-out in your planner. Everyone knows that the seat you pick on the first day is your seat for the rest of the semester. Pick a seat that makes you feel comfortable within that class. It’s always good to pick a seat within the middle-front of the room. This will ensure you can hear and understand the class/teacher. If you can focus in the back of the class with no distraction then do that, but it’s best to always be closer to the front. The teacher will also be able to put your name (when doing attendance) with your face if he/she can see you clearly in the room. Make your schedule your phone background. This has saved me so many times. Schools are big, so getting lost or confused the 1st week is real lol. Our phones are always in our hands, so having your schedule as your background will help keep you on track. If you’re in a class and know absolutely no one, make friends. Don’t just go to class everyday and never say hi to anyone. 1) thats rude, and 2) everyone feels the same as you. It’s always good to be friendly with the people in your classes. If you ever need help with something like homework, you can ask them to help you. Also you can ask to study together for an upcoming test. Classmates are great resources for help within a class (NOT THE KIND OF HELP WERE YOU ASK FOR THEIR HOMEWORK DO NOT DO THAT! DO YOUR OWN WORK). Stay positive. Don’t step into a class thinking, “I’m going to fail.” You probably will then. Always remain positive. If it’s a hard class, take it one step at a time. If you remain positive, your grades will be positive. Always give it your all. Well, there’s my 6 tips on What To Do During The First Week of School. I hope these tips help you! Good luck this semester and welcome back!